Starting from the premise that most trail bikes never leave the blacktop, Gilera conceived a single-cylinder bike that retained the lightness and ease of control of a trail bike but proved itself even better adapted to urban use and twisting highways. The demand for this type of bike first manifested itself in France at the end of the 1980s. A growing number of owners had modified their trail bikes along the lines of the machines that compete in Supermotard races. The recipe is simple and consists of grafting the wheels, brakes and suspension of a sports bike on to the chassis-engine unit of a trail or motocross bike. Gilera, the first manufacturer to move into this new niche market, did just that in order to create the Nordwest, which uses the frame and engine of the RCA 600 Enduro. The rest – suspension, extra-wide 17 inch wheels, brakes, fairing – is unique to the Nordwest. Aggressive at will, the Gilera rapidly asserts its vocation as a leisure bike, as happy in town as on winding back routes. Its inertia-free steering, lowered center of gravity and lively single-cylinder engine make this a motorcycle at ease with itself in city traffic and agile on bends. Only the firmness of its suspension limits the range of the Nordwest to roads in perfect condition – despite which it can become dangerously unstable. 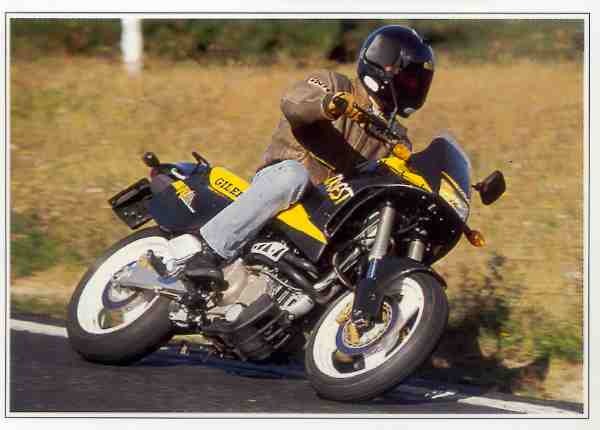 That aside, this Gilera has probably shown the way ahead for the big single. With highly successful styling, the Nordwest totally disregards the off-road pretensions of the trail bike so that it can give its best on properly surfaced highways.